I've developed a late in life passion for grits. I never had grits in my life before one terrible hungover morning when Megan cheerfully forced them down my throat. Have some sludge, she chirped and just like that my late night discretions were gone...well the ones I could make go away were anyway...ha ha. When that fateful day when Checkers STOPPED SERVING BREAKFAST....I kind of gave up on the whole grits thing altogether. That is till I have visited Savannah twice this year...now I am back on the grits train...but until now I have never attempted to make them. This recipe is from Martha Stewart, of course...because who else is gonna teach me? Baby arugula adds nutrients and a peppery flavor to this dish. 1 Preheat oven to 400°. Brush four 8-ounce ramekins or other small ovenproof dishes with oil. Prepare grits according to package instructions. 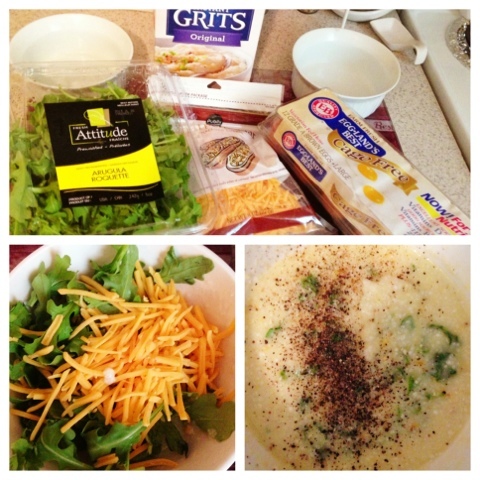 Stir in arugula and 2 tablespoons cheddar, and cook until cheddar melts, about 30 seconds. Season with salt and pepper. 2 Divide grits among dishes. Make a well in each, then crack an egg into each well; season. Bake on a rimmed baking sheet, until whites are set but yolks are still runny, about 20 minutes, rotating sheet halfway through. 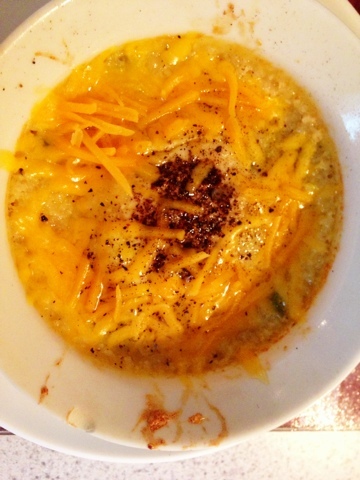 To serve, top grits with remaining 2 tablespoons cheddar and a sprinkle of pepper. I have never had grits--maybe since I'm from Nebraska. :) I love your blog--such fun stuff on it!